Gerovital Review | Does Gerovital Works? 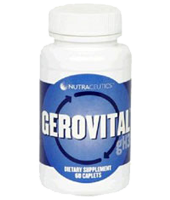 Gerovital, also known as GH3 (and related variants), is a controversial preparation that is promoted as having anti-aging properties. The Food and Drug Administration (FDA) have banned GH3 from interstate commerce and importation into the United States since 1982. The basis for Gerovital is procaine hydrochloride, most well known under the brand name Novocain, a local anesthetic. The final formula was developed in Romania by Ana Aslan and included adding benzoic acid, potassium metabisulfite, and disodium phosphate to stabilize it and enhance its effect. During the 1960s and 1970s, it was reported that celebrities would seek treatments of Gerovital at Ana Aslan's clinic to take advantage of the drug's anti-aging effects. Helping patients with Parkinson's disease. Tightening and smoothing of the skin. Although marketing and uncontrolled studies give the impression that Gerovital is a wonder drug, later controlled studies have suggested that the risks may outweigh the benefits. A review commissioned by the National Institute of Aging conducted in 1977 found that GH3 failed to hold up to most of its claims. In fact, those using Gerovital reported side effects such as convulsions, difficulty breathing, and low blood pressure among others (Reference to clinical studies can be found here http://en.wikipedia.org/wiki/Gerovital). How Does Gerovital Help Brain Function? Some older studies of Gerovital suggest that it may have use in promoting the improvement of memory in persons without any cognitive impairment. Though one would have to weigh the risks involved since the side effects are more proven than the actual benefits. Studies also show that it has no effect on those already suffering from neurodegenerative diseases. Also, because the FDA still imposes a ban on GH3, it may be marketed as a supplement since these are less strictly monitored. GH3 sold this way could contain a phony formulation of the drug though still claim to have the same positive effects by the manufacturer. To find well-known and reliable supplements with benefits similar to those claimed by Gerovital, please check our brain supplement review chart.